Before the war Agnes did children's illustrations using rosey cheeked dolls. During WWII she put her talent to the national good. 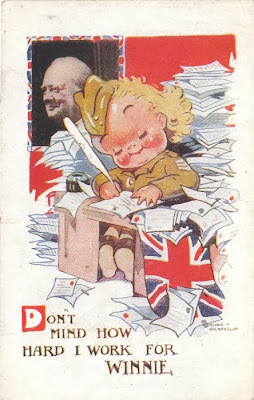 On the front is says 'Don't mind how hard I work for Winnie' and on the back it has Let us all strive without failing in faith or in duty - The Prime Minister. That doll is writing lots of letters. I hope some eventually get sent.